Okay, y’all know I’m straight up gangsta fo sho, right? Good. Don’t let that image stray from your mind. But ain’t nuttin’ funny ‘bout how recent events have been conspirin’ to soften the ol’ J-Dawg up like a cantaloupe that’s been sittin’ in the fridge for six weeks. (That really happened in my fridge recently, and trust me, it was muuuuuushy). First of all, the end of a school year tends to make me all introspective and reflective and contemplative and pensive and (insert word here)-ive. At the end of May I braced myself to resist believing that I could actually care about those no-good, worthless, soft-shelled, pseudo-students. Throughout the summer I’ve been weathering the temptation to think fondly of them with only moderate success. In my weakened emotional state, the touchy-feeliness of GNOWP suckered me into kinda exploring my feelings, and squishy sappy crap like that. We keeps it real on tha Mathside, and that writing class ruthlessly assaulted my naturally-thuggish sensibilities. The chicks that comprised the majority of the class kept bullying me into sensitive realms such as sharing emotions with each other. It was brutal, bro. Then, like a one-two sucker punch, a barrage of beautiful baby boys bombarded Big J. Margaret, one of four facilitators for the writing project, missed almost the last two weeks of class lest her big basketball belly burst. 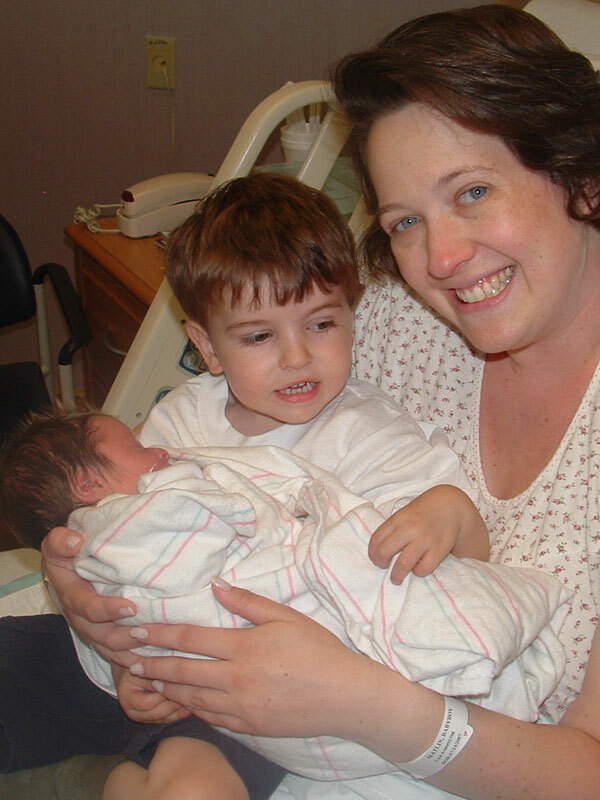 She finally gave birth on July 2 to Aidan James Albert Greiner, who measured in at a whopping 9 lb 9 oz, and 21 inches. I don’t tend to gush over newborns, as such tendencies clearly violate the Mathside Gangsta code of conduct. However, I’ve had two occasions so far to visit Margaret, her husband Chuck, and Aidan. Oh god, he is sooooooo cuuuuuuuuuute! In a nefarious plot to further chisel away at my rock-hard exterior, the parents encouraged me to hold Aidan. I yanked him up by the nape of his neck like a mother cat. What? Two hands are recommended? Okay. With a little guidance I learned the proper way to hold a baby, which naturally lures the unsuspecting gangsta to gaze into the infant’s eyes, listen to his coos and gurgles, and admire his wholesome innocence. Awwwwwwww! Soooooooo frikkin’ preciooooooous! Then, as if Aidan wasn’t already compromising my hard-core street cred on his own, the date of my second visit bestowed a new life into my own family. Joshua James Matlin-Heiger was born on July 14, measuring in at 7.0 lbs and 20 1/8 inches. My cousin Beth, her husband Neil, and their first child Jacob are all thrilled to welcome him to the club, as are the rest of our family. While I was not with them in Boston for the joyous event, I can now imagine what it must be like to hold him and look into his darling eyes. Adooooooooooorable! 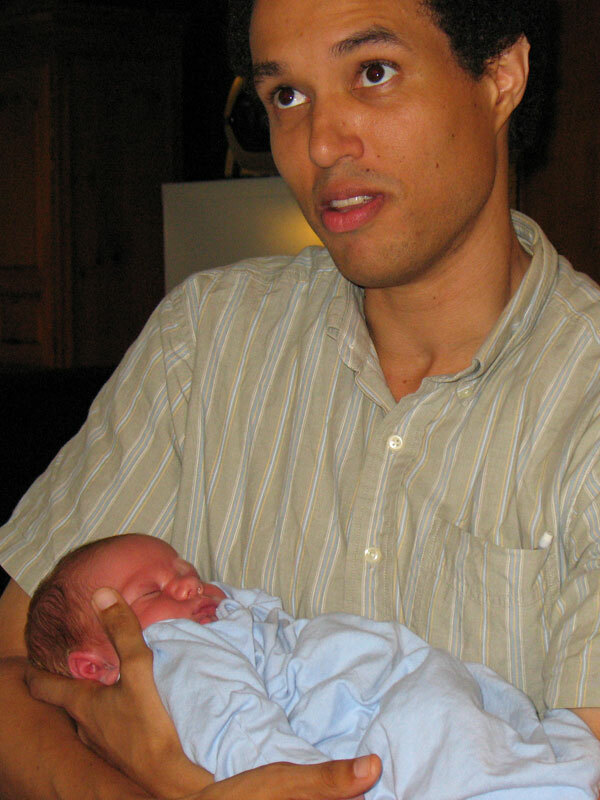 My expression indicates a natural ease with holding infants. Aidan doesn't appear worried. Joshua, in the company of his big bro Jacob and my cousin Beth. Back at home, the mauling of my manhood continued. My sweet babies Kong and Estelle refuse to stop endearing me with their delightful antics. 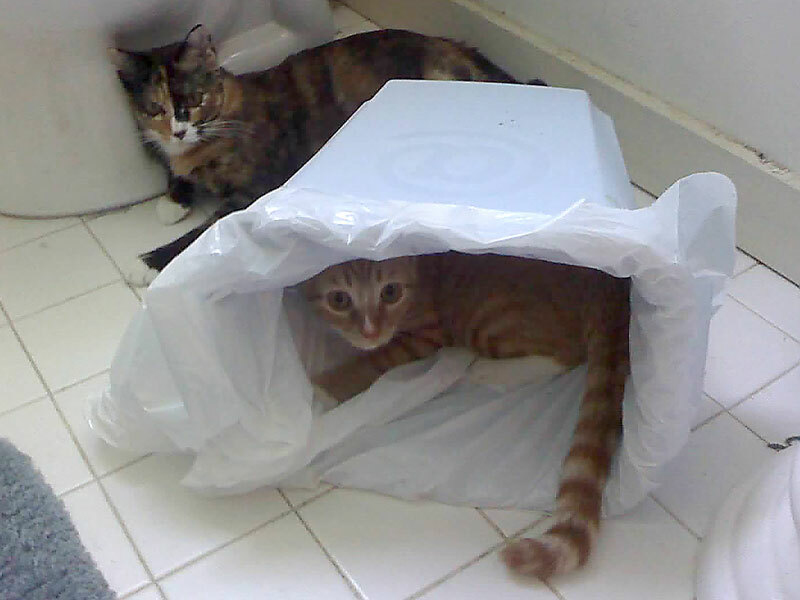 They’re probably almost a year old by now, yet they still scamper through the apartment like kittens and explore their world with wide-eyed curiosity. When I’m laying in bed each morning with two furry girlies crawling all over me and purring in my face, I can’t help but snooze a little longer and allow them to keep stealing my affections. Shoot – Will I ever be able to show my face on the mean streets of Silicon Valley again? Can I somehow redeem myself by adopting a big, manly-man dog? Maybe a pit-bull, or a Rottweiler, or a Komodo Dragon? Instead, my friend Michelle left on vacation for the week and asked me to care for her wittle bunny wabbit, Sasha. Now real G’s know that bunnies ain’t no joke. Those powerful back legs and Freddy-Kruger-like claws can do some serious damage when they get spooked, as I’ve found out the hard way. Plus that fur ain’t nuttin’ nice on my allergies. Perhaps against my better judgment, I let Sasha run loose in the apartment when I’m home. 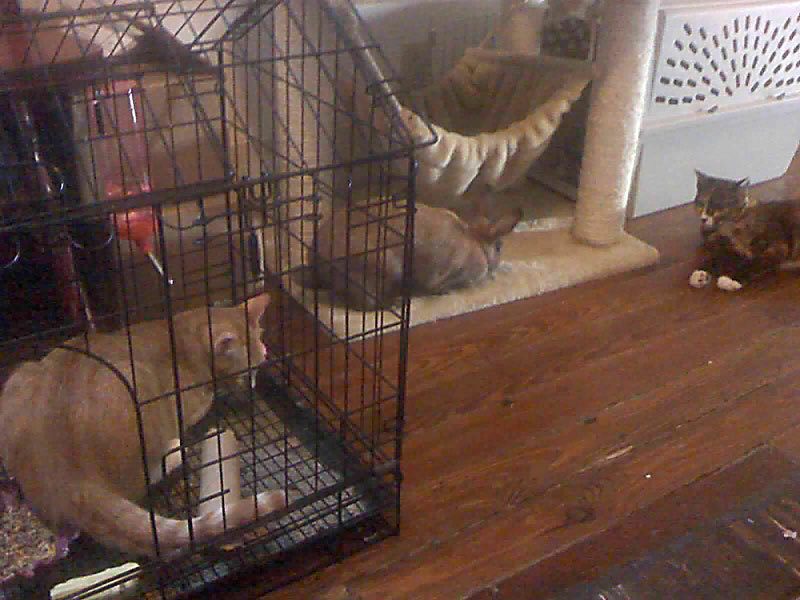 Kong and Estelle are curious about her, but they ultimately defer to her dominant character. Sasha leaves small puddles and hard little pellets everywhere as a reminder that she just don’t give a f#@%. Now that’s gangsta. 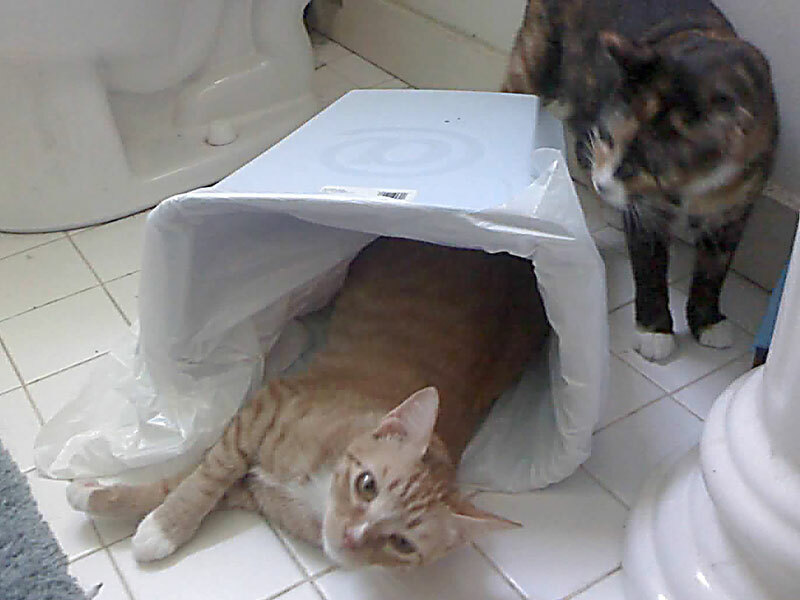 Kong being goofy with a wastebasket, while the more-dignified Estelle looks on. 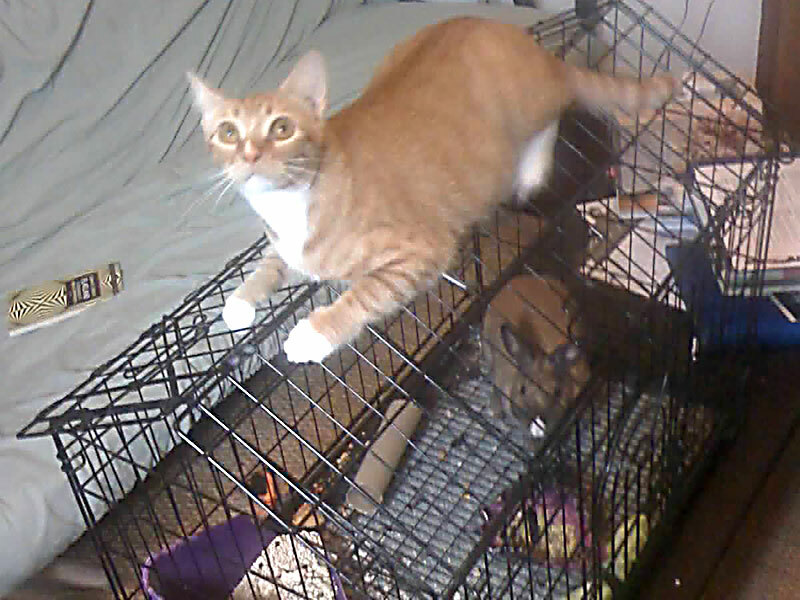 The kitties were awfully curious about Sasha, if not a bit afraid. 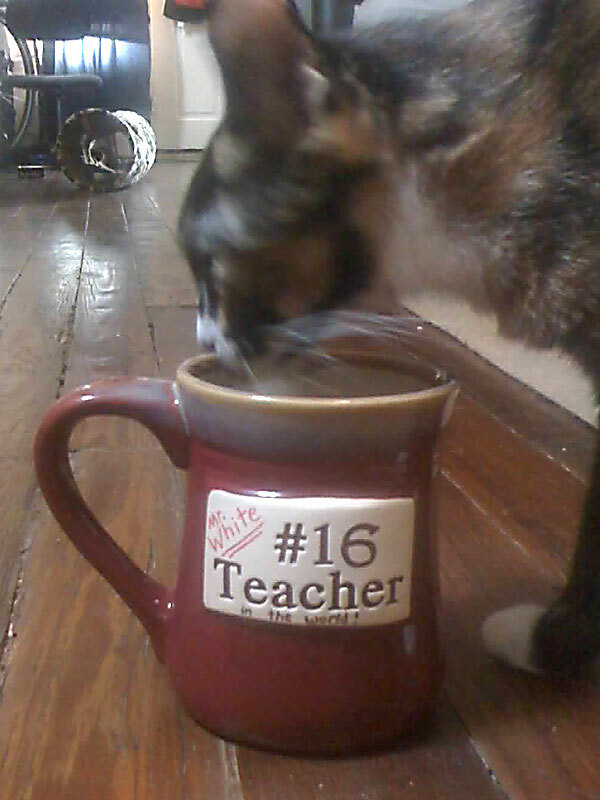 Estelle inspects my new mug, which was personalized to reflect my humility. Will I at least recover some of my badass rep through a strategic selection of summer reading material? IsweartoGod, if this book makes me cry, I’m just gonna throw in the towel and start shaving my legs. 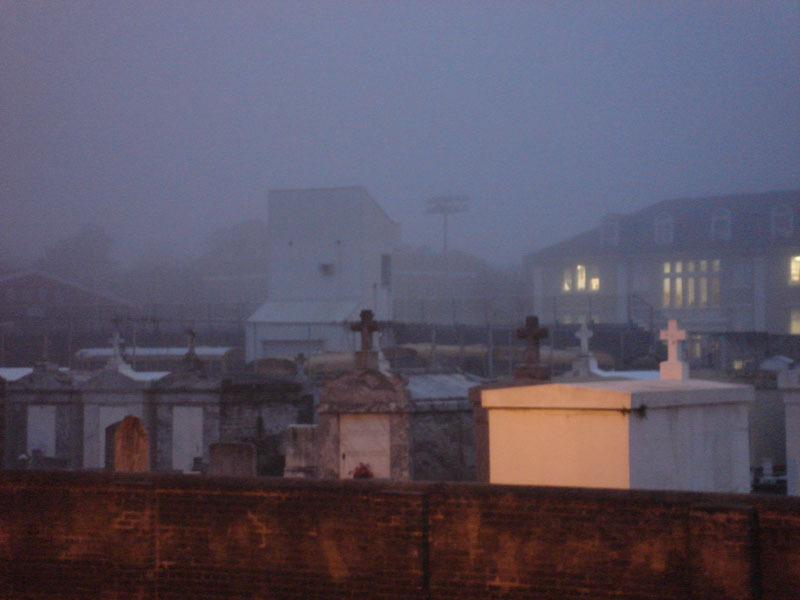 At least I get some props for living across the street from a cemetery, right? It can look pretty creepy when the fog hits it just right in the pre-dawn moonlight, like something straight out of a Scooby-Doo episode. Last weekend, for the first time in the 1+ year that I’ve lived here, I witnessed a new arrival in the neighborhood. 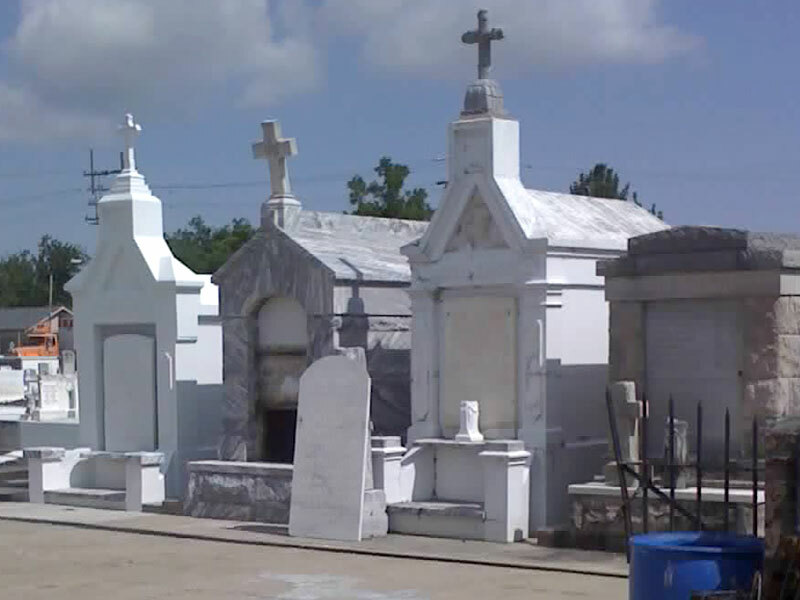 I’ve long been curious to see such a proceeding, as New Orleans has quite a rich and unique history for dealing with the dead. From my understanding, frequent flooding and the preservation of French/Spanish traditions are the reasons for the above-ground crypts. Furthermore, the hot, subtropical climate essentially cremates the bodies slowly in the oven-like tombs, allowing the bones and ash that remain to be pushed to the side or back of the tomb. After a year and a day, a new body may be added, allowing multiple generations of a family to share the same final resting place. Many a single tomb has a dozen or more names carved into the front surface. The St. Vincent dePaul Cemetery #1, earlier this year. A new occupant is arriving. 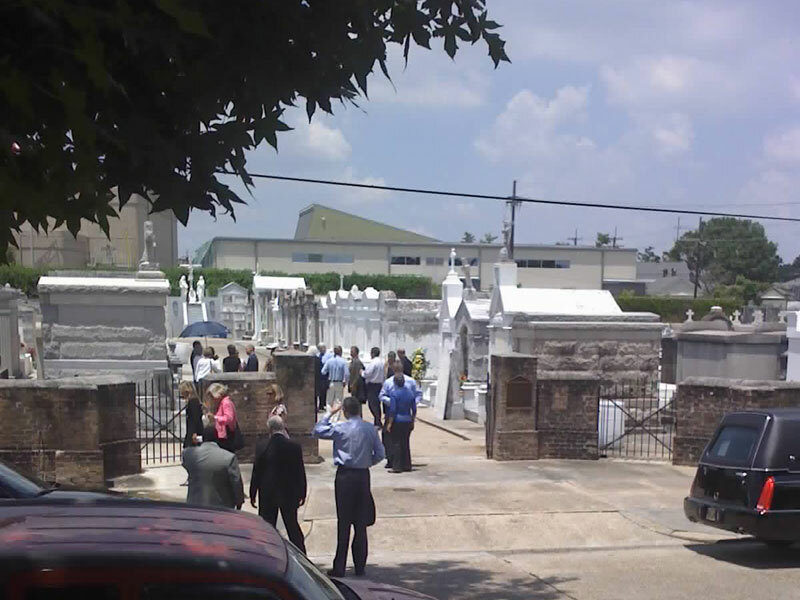 View of mourners from my front porch. Oddly, flowers remained only with the neighboring tomb after everyone left. So on this particular day, black cars lined the street while mourners paid their respects. I’d never seen a tomb opened before, and I felt obliged to keep a respectful distance (Hmmm, was it inappropriate of me to take photos?) 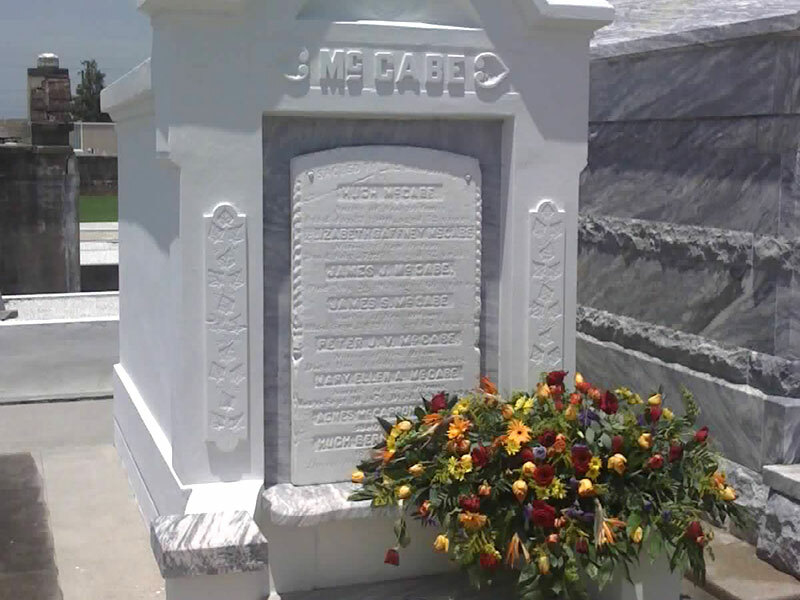 Rather than revel in how cool it is to live across the street from one of New Orleans’ famed “cities of the dead,” I found myself wondering about the life of the person being laid to rest. Issues of faith and my own purpose in life seem to be occupying my mind lately. I’m reminded that I need to keep growing and becoming a better person. I’ve evolved quite a bit in the last few years, but there’s a long way to go. Here I go, introspecting again. It’s been an interesting summer. Perhaps I’m not the heartless, hard-headed G that I once was.